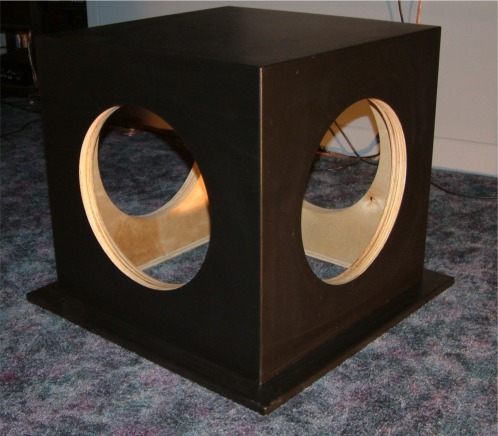 The goal of any subwoofer is to deliver the lowest octaves of music with the least amount of distortion possible at sound pressure levels that match those of the rest of the system. Since my Martin Logan rig can play very clean at SPL's greater than 105dB, I need low frequency reproduction that can keep up and pressurize the 3K cubic foot home theater. While I had two Velodyne ULD-18's in my home theater before, they could not move enough air to keep up. Which brings me to the main point of all great subs: they have to displace air in significant quantities. Most commercial subs have relatively small volumetric displacements, and I'll use the rather large ULD-18 here for comparison, which displaces a total of 2.15 liters (or 131 ci). In contrast, my IB sub displaces 15.24 liters (or 870 cubic inches), which 6.5 times as much one Velodyne. The other characteristic of Infinite Baffle subs is that they have very low distortion figures due to operating many drivers in their cleanest ranges and not forcing them to compress air in a box. This IB is the perfect math for the ultra-low distortion Martin Logan electrostats. I innovated a design for in-room manifolds (called an 'outie') with this particular design, as can be read in the design and install discussion I wrote at the time. In my decent sized home theater (26 x 16 x10), I used to run 2x Velodyne ULD-18’s as my subs. These are very good subs and have low distortion (my main criteria for ‘good’). However, they did not play quite loud enough to keep up with my Martin Logan Electrostats (big Monoliths III’s in the front). Also, after 12 years with them, I wanted something new. This led to investigating subs and sub options, which eventually led me to the ‘Cult of the Infinitely baffled’ site, which led to a conversion (thanks Thomas). The big problem turns out to be that the ideal location for the manifold is the front / middle of the room, which also turns out to be where the homes main power feeds (two huge 200amp service feeds) run right under that spot of the floor as can be seen here on the left. After a few exchanges with the members of the ‘Cult of the Infinitely Baffled’ forum (thanks guys), it was established that it ‘should’ work in theory. Using his shop full of excellent tools, he cut perfect holes for the drivers and added a bottom flange so attachment to the floor would be straightforward and secure. Next is the install. Again, my friend Eric comes to the rescue, armed with all kids of cool tools to help install the box into the HT. Installing the drivers into the box presented a choice: Install facing into the box (as is usual for under-floor manifolds) or put them in the box facing out (as normal for regular sub boxes). I chose to mount them facing out, as we had built a sufficiently large box, there would be no internal interference, and I sensed that the air volume was still large enough that no untoward noises would be generated by that. So far, this has proven to be true. This also improves the in-room look of the IB, as it really does look like any other large sub box, but with more drivers. Installing it into the floor was a piece of cake. Eric, in his usual meticulous way, measured out a screw pattern for the flange, making sure it did not interfere with the screws he ad added to the sub-floor reinforcements he had also put in (belt and suspenders stuff), then drilled out the screw pattern from the back of the flange, drilled counter-sinks for the heads on the top side and then we were set to drop it in. The wiring is pretty straight forward. I chose to use one voice coil per driver (the AV15 is a Dual Voice Coil, with each VC having a 2ohm load). To give the amp a 4 ohm load per pair of drivers, I series connected each pair to each channel. Using my Crown XLS602 pro-sound amp, I get 600 watts per channel into 4 ohms, or a total of 1,200 watts for the entire IB. This is way more than enough to push these drivers to xMax. So, How does it sound, you ask. It is awesome, simply awesome. Even before tweaking the parametric EQ’s, the thing just floored me with how clean it sounds. I played the new Sting album (in SACD) and you could just feel the texture of each bass note. The extension was also impressive (but my Velo’s also went deep). The room actually gets pressurized now on the really low notes. This is a sensation that was rarely felt with the previous subs. I attribute that to the higher SPL capabilities at low freq’s of the IB. Now that it’s all tuned and EQ’d, it is simply amazing. So clean, and so, so powerful. I had no idea a sub could deliver this level of performance, much less at this price point. The quality of the bass is the best I’ve ever heard, with ultra-low distortion (the combo of Sub and center channel together measures under 0.6% distortion at 90dB SPL).